MGM is getting ready for Father's Day. If you dad is an action kind of guy, MGM should have an affordable DVD for him at your local video store. Among the many great titles being released or re-released for this Father's Day are "The Good, The Bad and the Ugly," "Bull Durham," "The Great Escape" and John Wayne's "The Alamo." John Wayne spent nearly 10-years and his entire fortune bringing this epic film to the screen. Like Mel Gibson, John Wayne pursued his goal with a single-minded fervor. Wayne produced, directed and starred in the epic Western, which was honored with 7 Oscar nominations. Like Gibson, John Wayne was the subject of public ridicule for his film. The critics unjustly panned the film. The $12,000,000.00 film didn't make its money back on its US release. The film was further stigmatized by an outrageous Oscar Campaign that called the Academy's patriotism into question. Wayne became a man possessed. It took a truly tasteless Ad-Campaign by Chill Wills to wake the director up. 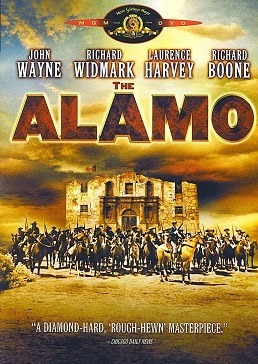 Despite all of the controversy, "The Alamo" is a deft action film. Though the early dramatic scenes are a bit wooden, Wayne was rightly praised for his handling of the 13-day Battle of the Alamo. The film features an all star cast. John Wayne plays Davy Crockett. Laurence Harvey appears as Col. Travis. Richard Widmark steals the movie as Jim Bowie. Richard Boone plays Sam Houston. A multitude of John Wayne movie regulars appear in character roles. Wayne's film is an ultra patriotic take on the Battle of the Alamo. Though all of the defenders lost their lives, they delayed the march of Santa Anna long enough for Sam Houston to later defeat him and the Mexican Army. Thus the Republic of Texas was born. Good movie, picture, sound and extras. Not a bad transfer considering the movie is almost as old as me. MGM cleaned up the print quite a bit. There are some artifacts. The colors are rich, but not filthy rich! Some washout. The edges are a bit soft. Some shimmering and delineation problems here and there. Overall, a good transfer though. It would be nice to see the entire film restored, including the 33 minutes of footage missing from the director's cut. While there is no loss of dialogue, the sound is a bit flat and tinny. Good use of the surround sound features during the last half of the film. The massive battle scenes take up half of the films running time. There are a few great sound effects where the cannon will fire on one side of the room and explode on the other. The DVD includes a 45-minute documentary about John Wayne's quest to get this movie made. Son, Michael shares his memories of the experience. The documentary includes an number of interviews with several familiar faces from the film. I especially enjoyed the segment dealing with director John Ford's unexpected and prolonged visit to the set. The DVD also includes the film's original theatrical trailer. I'd like to see the original director's cut restored on DVD. It would be outstanding if MGM would invest the money in that part of their history. On the other hand, I can't dismiss this DVD. You get a lot more for your money with "The Alamo" than you do with many other higher priced DVDs.